PASADENA, Calif. November 27, 2018 /3BL Media/ — OneWest Bank today announced a new campaign in partnership with Feeding America® inviting customers to help people in need this holiday season. As part of the campaign, OneWest will donate 250 meals for every qualifying checking account opened, in addition to providing a $250 cash back bonus for each customer. Donations will benefit food banks serving Southern California, including areas impacted by the recent wildfires, and will go toward a broader company goal of donating one million meals this holiday season. 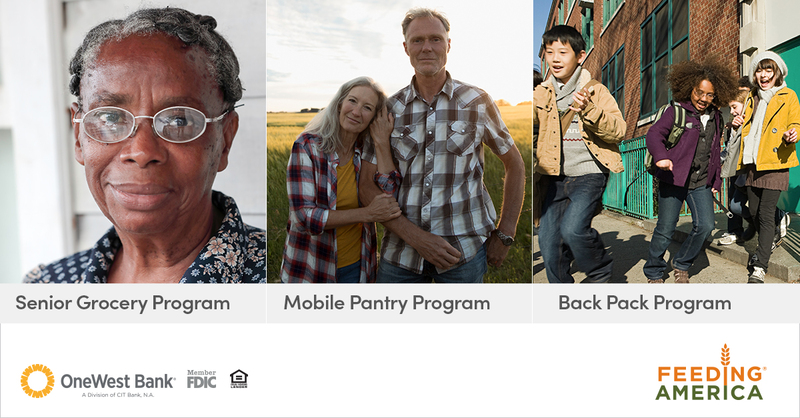 Participants can also follow the #GiveLikeYou hashtag on OneWest Bank’s Facebook page to cast their vote in support of Feeding America’s Back Pack Program, Mobile Pantry Program and Senior Grocery Program. For every vote, OneWest will donate 10 meals to the program of choice. “We encourage customers, employees and others to participate through social media or by opening a new account in one of our local branches,” continued Solk. The #GiveLikeYou campaign is part of a national partnership spearheaded by OneWest’s parent company CIT. The campaign will donate a total of one million meals this holiday season. Feeding America® is a nationwide network of 200 local food banks and 60,000 food pantries and meal programs that together serve more than 46 million people each year. The organization estimates 1 in 8 people in America faces hunger. To receive a bonus, customers must open a new checking account (Personal Checking, Premium Checking or OneAccount Checking) with a minimum initial deposit of $1,000 in new money between November 27 and January 15, 2019, and satisfy certain other important requirements. See full terms and conditions at www.onewestbank.com/holidaygiving.